Posted December 26, 2013 by Eric Graham . In my previous blog on ad extensions, I wrote about just a few of the different types of ad extensions available to attach to an ad group or campaign. A recent Google AdWords update (announced at the end of October) changed the effect that ad extensions have on your campaign performance. Prior to this update, ad rank was determined through calculations based on max CPC bid and Quality Score. Now, Google is adding in an additional factor: the impact of ad extensions. It is now more important than ever to utilize ad extensions in every AdWords campaign, as it can be just the edge you need to beat out your competition in ad position. If two competing ads have the same bid price and quality score, then the ad with the more expected positive impact from the linked extensions will generally appear higher in position than the other. When an ad auction takes place, Google determines which combination of extensions will be the highest performing and most useful to the user. Google estimates the expected impact of extensions with factors such as relevance, click-through rate, and the prominence of the extensions on the search results page. This means that in order for your extensions to even appear, you may need to increase your current quality score, bid price, or both in order to increase impressions and click-through-rate. The following search example below is a demonstration of Google serving up extensions that would be most applicable to my search term, “dentist in littleton”. As a user, I am most likely to click on the ad in third position, as it has extensions that are most useful to me for that specific query. 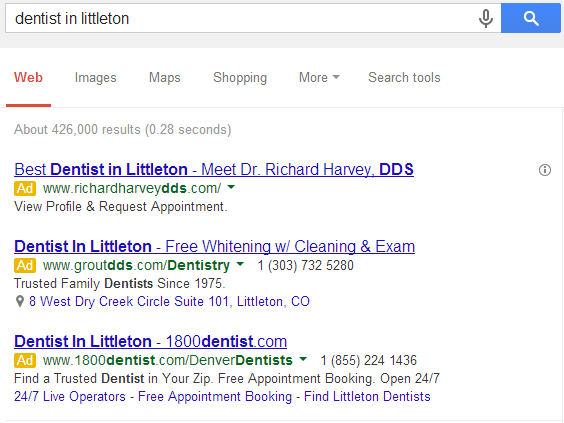 I am not looking for a specific dentist or office, as I may be unaware of my options, so I would click on the link for “Find Littleton Dentists”. Over time, that third ad position will most likely increase to first or second if it continues to get a good click-through rate from those extensions from users. If you have not yet attached link extensions to your AdWords campaigns, I would highly recommend doing so soon, so you do not miss out the competitive advantage for ad position within search results. Not sure how to get started with extensions? AMG has experts in a variety of marketing services including SEO, Pay-Per-Click Management, Email Marketing, Social Media, and Web Design.